We recently had the pleasure of designing a map for the Lower Gwenydd Business Association in Spring House, Pennsylvania (a Philadelphia suburb.) 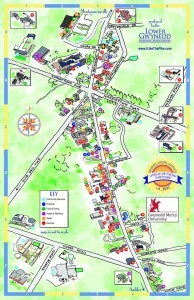 Local businesses place their services on the map with a corresponding directory and key. The map is all digital, so very easily edited.